Then even staying in forest retreats is just paying rent. Then even staying on the homestead is the hermitage supreme. 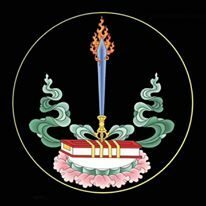 And so it is that I beseech thee not to let thy mind be depressed about the maintenance of households and monasteries; for if embraced with the excellent aspiration of Awakened Mind (bodhicitta), it becomes the Dharma. Translated from the Tibetan by Erick Tsiknopoulos, March 2016. Found in the collection of poems, songs and other writings by Marpa Sheyrab Yéshey, chos-rgyal smar-pa’i mgur-‘bum legs-par bzhugs so, published by the Martsang Kagyu Global Corporation, Taipei/Delhi 2015, pages 150-151. “just paying rent” (khral ‘jal): khral literally means ‘tax’ (and is still the common Tibetan term for taxation), but in older usage can also mean ‘rent’, as it probably does here. Next Next post: A Russian Translation of Our Translation of Mipham’s Tārā Prayer!